Bangkok (Thailand) – January 22, 2019 (travelindex.com) – The Thailand Tourism Forum (TTF) returned for its eighth edition, with an action-packed agenda focusing on the mega-projects that are currently transforming the tourism landscape in Bangkok and beyond. Running under the theme “Managing Tourism – Ensuring Great Experiences and Sustainable Outcomes,” Thailand’s largest annual hospitality event secured a record audience of 850 tourism and hospitality industry leaders at the InterContinental Hotel Bangkok for a full afternoon of interactive and informative on-stage sessions. 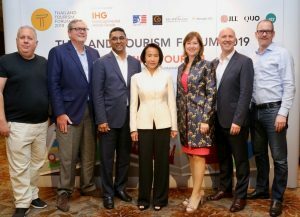 TTF 2019 zeroed in on how Thailand’s tourism sector is getting a massive makeover. With international visitor arrivals continuing to shatter all previous records and Bangkok becoming the world’s most-visited city*, the event examined how the country is developing new infrastructure and facilities to cope with the influx. These include huge integrated tourism projects, vast retail attractions, branded theme parks, urban transport networks, airport rail links and more. David Keen, CEO of QUO, and Stephan Roemer, CEO of Diethelm Travel Group, looked at “Destination Marketing – Thailand & Overseas Best Cases;” Nikhom Jensiriratanakorn, Director of Horwath HTL, talked about “Thailand’s Rail System Plans & Reality;” Nihat Ercan, Head of Investment Sales at JLL Hotels & Hospitality Group, addressed the subject of investments with a session entitled “A World View of Hotel Costs – Develop or Acquire?”; Eric Ricaurte, founder & CEO of Greenview, and Prae Piromya, GM of Planning & Operation, Sustainable Development Office at the Central Group, discussed “The Great Debate – Does Green Pay?,” and Eric Levy, Managing Director of TSI, and Clarence Tan, Managing Director SEA & Korea at InterContinental Hotels Group, led a session of attractions called “Hey Neighbor, Can I Borrow Your Waterslide?”. Thailand Tourism Forum is an annual event held every January and organized by the American Chamber of Commerce (AMCHAM) Thailand and leading hospitality consultancy C9 Hotelworks Hospitality Consulting Group. Now in its eighth year, the event attracts leading industry speakers and a growing number of delegates from around the region. Thailand Tourism Forum offers delegates a unique opportunity to hear hospitality leaders and experts candidly discuss the industry and a forum to take a closer look at numbers, evaluate risk and learn more about important new trends in tourism across all Thai travel destinations.